Sandals Negril Resort is focused on one of the best stretches of Negril Jamaica's world class Seven-mile Beach. All of the accommodations are in very close proximity to the beach with many of them beachfront. In addition, the pools and most of the restaurants are also located at beach edge. Beach section in front of Sundowner pool, piano bar, and the Paradise Building. The red buildings all the way on the left are the Bamboo Grove and Coconut Cove Buildings which include the Loft Suites. Sandals Negril is perfect for both relaxation and watersports. Sandals Negril's direct western exposure brings unique sensational sunsets not found at the other Sandals Resorts in Jamaica. 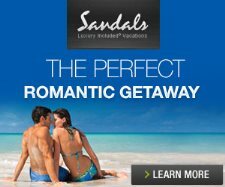 Each of the 3 St Lucia Sandals Resorts also enjoy direct western exposure.